Electrically programmable switches are used to program an FPGA. Performance of an FPGA in terms of area and logic density is a function of properties of these switches. Properties of these programmable switches that make difference are on-resistance, parasitic capacitance, volatility, re-programmability, size etc. Static RAM cells are used to control pass gates or multiplexers. 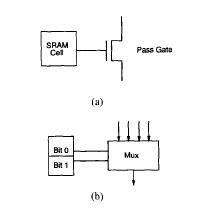 To use pass gate as closed switch, boolean one is stored in SRAM cell. 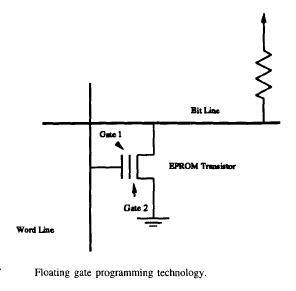 When zero is stored pass transistor provides high resistance between two wire segments. Figure a depicts this usage of SRAM. To use SRAM as multiplexer, state of control values stored in SRAM decides which of the multiplexer inputs are connected to the output as shown in figure b. Advantage of SRAM is that it provides fast re-programmability and integrated circuit fabrication technology is required to build it. While disadvantage is the space it consumes as minimum five transistors are required to implement a memory cell. Technology found in ultaviolet erasable EPROM and electrically erasable EEPROM devices is used in FPGA from Altera. The programmable switch is a transistor that permanently be disabled. Here again the advantage is reprogrammability but there is another advantage no external permanent memory source is need to program it at power-up. However it requires three additional processing steps over CMOS technology. Other disadvantages are high static power consumption due to pull up resistor and high ON-resistance of EPROM transistor. Electrically programmable EPROM is used by AMD and Lattice. Use of EEPROM gives advantage of easy reprogrammability. However EEPROM cell is twice as large as EPROM cell. An Antifuse is a two terminal device with an unprogrammed state providing very high resistance between its terminals. To create a low resistance link between the two terminals high voltage is applied accross the terminals to blow the antifuse. Extra bit of circuitry is required to program an antifuse. Antifuse technology is used by FPGA's from Actel, QuickLogic and Crosspoint. Advantage of Antifuse is relatively small size and hence area reduction which is anulled by area consumed by extra circuitry to program it. Another big advantage is low series resistance and low parasitic capacitance.